Galen Central will be doing a summer series profiling USC’s incoming basketball class, including transfers. Our next profile is on Devon Phleuger, a freshman small forward from Orange County, CA. Read earlier profiles on: Kahlil Dukes, Nikola Jovanovic, Julian Jacobs, Pe’Shon Howard, Katin Reinhardt, and Darion Clark. After playing in one of the toughest leagues in the nation throughout high school, the Trinity League, freshman Devon Pflueger shouldn’t have much trouble adapting to the quicker and more aggressive play of Pac-12 basketball. 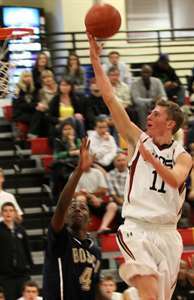 Out of Juniper Serra Catholic High School in Orange County, Pflueger played against national powerhouses like Mater Dei and Orange Lutheran night in and night out, and is excited to face his former league competitors in Pac-12 play, whether they are on his side or not. The player that will be on his side, although not for the 2013-2014 season due to NCAA transfer rules, will be UNLV transfer guard Katin Reinhardt, who was a Trinity League star at Mater Dei. Arizona’s Gabe York, who went to Orange Lutheran, and Colorado’s Xavier Johnson and Eli Stalzer, who both went to Mater Dei, are also among a group of Trinity League players that Pflueger will be seeing again in Pac-12 play. The 6-foot-6, 185-pound small forward has a lengthy frame with long arms and a fair amount of upside. He is also quite the effective shooter off the catch and utilizes the pump fake very well for his pull-up game. According to Pflueger, his game could be compared most to that of Golden State Warrior’s shooting guard Klay Thompson, who also graduated from a Trinity League participant, Santa Margarita Catholic High School. Using his lengthy frame, Pflueger has also built himself into a tremendous perimeter defender, according to his high school coach, Joedy Gardner, who has trained NBA players like Brandon Jennings, Kevin Love, and Tyson Chandler. After being recruited as a walk-on under former head coach Kevin O’Neill , Pflueger is enthusiastic about the hire of new coach Andy Enfield from Florida Gulf Coast. With the hire of Enfield and his new up-and-down playing style, Pflueger sees himself as being able to play a variety of positions on next year’s team. Although he played small forward in high school, he sees himself to be most likely playing as a shooting guard, although he would be open to be inserted into the “3” slot. Something that Pflueger has grown up with is a sibling rivalry with his little brother Rex, who is going to be a junior at Mater Dei next year after transferring from J-Serra. Rex is a three-star guard that is being recruited nationally, and USC has already offered him. According to Devon, he and Rex have had their battles over the years, although they have spent two seasons as members of the same high school team. The brothers could have the chance to team up once again should Rex decide to take his talents to USC. For Devon, though, he is already looking forward to getting to USC and joining his freshman class in summer workouts. Devon, who is planning on majoring in business, says that his most important goal in the near future is to get back healthy after coming off an ankle injury. Once healthy, he should prove to be a a valuable asset for coach Enfield’s team as a recruited walk-on next season.